Take a look at this medley of ‘Gift’ stories that were told at Ex Fabula’s Spectacular event held at Turner Hall ballroom. Some of Milwaukee’s best; Grant Hagen, Amie Losi, Dan Niederloh, Deaduri Gales, Emmett Gross, Cindy Grover and Lisa Gatewood. This spectacular video was taped by Cole Quamme, Ryan Reeve, Li Wang, Adam Presti. Art Direction and editing performed by Adam Presti and Kara Mulrooney. See you on Tuesday 1/11/11 at Stonefly Brewery for our ‘It Gets Better’ story slam. Recap of the December Spectacular! thanks to our blogger Stephanie Kilen! An Ex Fabula audience is not easily fooled or deterred. We know the difference between rain and snow, so even winter horror stories from Minnesota could not keep the faithful away from Turner Hall on Saturday, December 11. After all, we were promised “gifts” – the theme for the storytelling spectacular. While some audience members went home with Ex Fabula buttons, or stickers, or a buzz from the famous Turner Hall Tall Boys, only one lucky audience member went home with the memory of kicking off the show by sharing her story on stage. Molly McGrath’s name was pulled from the dapper, white top hat. She told of the year her 10-year old self wanted only “peace and quiet” from her three older brothers and received a jar filled with green water from one of them that was supposed to do the trick. In between stories, host Leah Delaney read UltraShorts. Lest you think that UltraShorts are hot pants a la The Rockettes, UltraShorts are the one-to-two line stories submitted by audience members and read by the hosts – Megan McGee and Leah Delaney. There was no shortage of UltraShorts Saturday as there is obviously no shortage of odd and touching gift memories this time of year. Back for Round 2, nurse Cindy Grover held the audience in touched silence as she told about the Christmas she had to give a badly burned, 5-year old boy a painful treatment. The pain the boy endured and the pain it brought Cindy to have to do it turned into a gift for both of them when weeks after being discharged, the boy returned, perfectly and beautifully healed, to thank Cindy for her care. The audience was then treated to a story that couldn’t be touched by any Hallmark Christmas Special movie. Deaduri Gales told of her first Christmas after losing her mother and father within a year of each other. A then 10-year old Deaduri went to live with her aunt and uncle and a cousin who became her “instant sister.” After some months of initial disagreements, Deaduri and her cousin bonded over finding the hidden presents and a visit from a “bilingual, tipsy” and not-so-well-disguised Santa. While the girls knew it was their uncle, they, along with the rest of the family and even the elderly neighbors were “caught up in the magic” of Christmas and believed, right there on the front yard. Having quickly returned to their seats, the audience was ready for the last two stories. Emmett Gross’ stories were not about gifts, but were offered up as gifts to the audience for use as their own, should they ever want to use them. A generous man, Emmett handed out three glowing tales of his own personal embarrassment: getting stuck in the baby swing at a park at 12-years old; randomly vomiting all over himself as a Junior in high school; and not-so-brilliant idea of giving the finger when featured on the hockey game Jumbotron. Lisa Gatewood wrapped up the evening with the tale of her tangle with the Girl Scouts of America and a real desperate housewife. An under-privileged girl living in White Fish Bay, Lisa’s grandparents gave her the gift of Brownie handbook, Brownie sash and the fees to join. Thrilled to be aboard the “mother ship” of grade school social activities, she eventually realized that the troop leader was deliberately delaying her badge acquisitions thus preventing her from continuing on in the organization. Her one and only “Math Fun” badge, however, could not begin to serve her the way the life lessons she learned from the experience have. It’s hard when you’re having fun on Christmas Eve to be told that you must go to bed in order for Santa to come. At the end of the night, all the stories were told but the audience lingered just a while, hoping to catch a little something more. Luckily, we need only wait a month for more gifts. See you January 11 at Stonefly Brewing Co.! The December Spectacular is this Saturday night at Turner Hall. For anyone who missed Ex Fabula Radio on WMSE featuring stories from four of our Spectacular storytellers last week, we’ve posted the audio here for you to enjoy. Featuring stories from Cindy Grover, Emmett Gross, Lisa Gatewood and Amie Losi. Also telling at the Spectacular will be Dan Niederloh, Grant Hagen, Deaduri Gales and ONE randomly chosen volunteer storyteller from the audience! Click the link below to listen. Thank you to WMSE for production and recording of these stories. The crowd at Turner Hall in May 2010 at ALL STARS. Photo by Kat Berger. A shout out to all the artists who shared their words at Verbatim, a fabulous event put on by the Still Waters Collective on Thursday November 11. Thanks to Dan Niederloh and Lisa Gatewood who represented Ex Fabula at the event! We’re looking forward to the next event- we’ll be sure to post details so you can check it out! 92ND and Burleigh – enter parking lot off of 92nd St. (a.k.a. Swan Blvd ). TELLABRATION is a worldwide storytelling event coordinated by the National Storytelling Network and produced locally. It celebrates the art of storytelling and links storytelling enthusiasts on the same weekend around the globe. Storytellers well-versed in the art of relating stories by heart will present their best tales for adults. They have been hosting this event since 1990! And last but not least, get ready for the December Spectacular! Ex Fabula invites you to Turner Hall on Saturday December 11 at 8 pm for the December Spectacular, a night of true stories told by fellow Milwaukeeans on the theme of “Gifts”. This is a special non-competitive event that will feature new, longer form stories from a slate of proven storytellers. This storyteller lineup will feature some storytellers who have shared particularly compelling stories at previous Ex Fabula events and some special guests. In keeping with the spirit of our regular season monthly events, which will resume in January, one ten minute storytelling slot will be available to the audience volunteers who put their names in the hat that evening. That lucky randomly selected storyteller will kick off the evening with a story about “Gifts”. The night will feature Ultrashort Stories from the audience and some other surprises. This event is expected to fill up quickly, so be sure to purchase your tickets in advance. $10 tickets are available at http://www.pabsttheater.org/show/exfabulaspectacular and at the Pabst Theatre box office. The doors will open at 7 pm and seating is general admission. 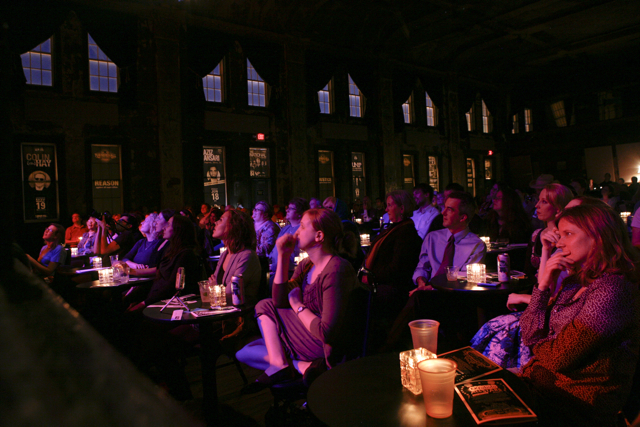 Ex Fabula was formed in Milwaukee in 2009 with the purpose of connecting storytellers with live audiences on a regular basis. For more information about Ex Fabula events past, present and future, go to www.exfabula.org. All stories told at Ex Fabula events are true, personal, related to a theme and told without notes. Ex Fabula is proud to be sponsored by 91.7 WMSE and 89.7 WUWM. Q: Can I tell a story at this event? A: There will be one coveted 10 minute storytelling spot available to audience members. We encourage you to prepare a story and put your name in the hat. One person will be chosen and we hope you will be the lucky one who joins the other predetermined storytellers on stage. If your name is not called, we hope you will join us at our regular season events which resume in January and most storytelling spots are available to randomly selected audience volunteers. Q: How long should the story be? A: Stories should be 8 to 10 minutes long. There is a timekeeper to help storytellers pace themselves. Be sure not to run over 10 minutes, as we are keeping time and we do not want to have to cut you off. A: We suggest that you know the first line, the last line and 5 to 7 plot points of your story and that you practice telling your story to friends, family, and anyone who will listen. There are more details in the storytelling guidelines. Q: Can I bring a gift to talk about? A: Sorry, this is not a show and tell event. No notes, no props – just a story, the stage, and you.